The stock market has continued to hit new all-time records, but some individual stocks have dramatically outpaced what the broader market benchmarks have produced. In particular, a select few stocks have managed to double investors' money over the past year, and many investors wonder whether these stocks have more room to run. 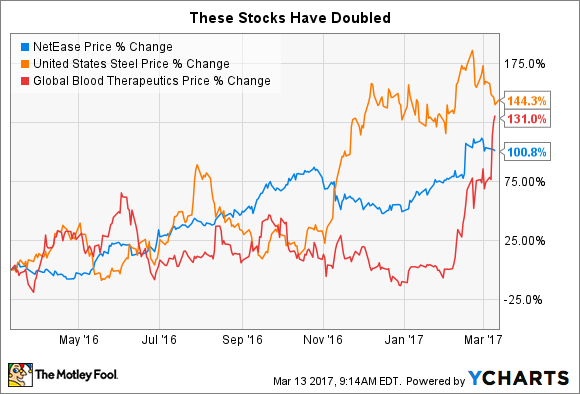 NetEase (NASDAQ:NTES), U.S. Steel (NYSE:X), and Global Blood Therapeutics (NASDAQ:GBT) took different paths to get to their strong performance, and each has different potential catalysts that could move its stock in the months and years to come. The Chinese video gaming industry has been a pocket of strong growth for a long time, and NetEase has done a good job of capitalizing on the potential of this key market. In its most recent quarter, it managed to boost its sales by more than half, and net income was up by more than two-thirds, continuing a streak of impressive gains for the gaming giant. NetEase has adopted a smart approach toward the industry, working to sustain its profits from the online gaming segment even as it expands into mobile and also looks at email, e-commerce, and other revenue streams to supplement its success. The result has been a 101% move higher for the stock since March 2016. Looking ahead, NetEase sees the mobile industry as the key to its future. The company believes that with mobile becoming the most important advertising platform in China, it needs to ensure that it gets in front of as many potential customers as possible. For investors, the fact that NetEase shares its profit gains in the form of dramatically rising dividends has only been icing on the cake for the dramatic share-price increases that the stock has produced over the past year. The steel industry has suffered from the slowdown in economic activity across the globe for years. Beginning when the fast-growing Chinese economy started to slow down, construction and infrastructure activity levels declined, and that hurt demand for steel at a key moment for the U.S. producer. Yet as you can see from the chart above, the November election results marked a turning point for U.S. Steel's stock, as investors looked forward to promises that President Trump made to reinvigorate American manufacturing and make long-needed improvements to infrastructure. More recently, U.S. Steel has given back some of its gains as investors worry about whether the Trump administration will be able to follow through on all of its planned initiatives. Nevertheless, the stock is up 144% over the past year, and with U.S. and global economic conditions looking more favorable, U.S. Steel has the potential to keep serving the world with the construction materials it needs to keep moving forward. Finally, Global Blood Therapeutics has delivered extremely strong performance recently with its gains of 131%. Investors have been enthusiastic about the prospects for the company's GBT440 treatment for sickle cell disease, and in January, Global Blood enrolled its first patient in its phase 3 HOPE study of the treatment for sickle-cell sufferers. Even after taking advantage of the jump in its share price to raise cash through a secondary offering, Global Blood has maintained its upward momentum. Now, some investors think that Global Blood Therapeutics might be a takeover target. Rumors have surfaced that Novo Nordisk might be interested in acquiring Global Blood. It's too early to tell whether those rumors will pan out, or whether the two companies will agree to a deal even if one is in the works. Yet investors can count on Global Blood to be in high demand if GBT440 lives up to its full potential for both sickle cell disease and other health issues. Stocks don't double every day, but these companies have been successful enough to warrant big moves. Investors shouldn't count on another double, but good prospects for these three stocks could keep their shares moving upward in the future.